What is the significance of the home? What kind of place did God design it to be like? In this day and age, people invest thousands upon thousands of dollars in a home, and for what? Is it simply to provide temporary comfortable or to look good before our family and friends? Could there be more significance to the way God intends for us to live within our homes? These are questions that have been on my heart and mind lately. Without vision and purpose to our homemaking, we can loose sight of the eternal significance of this role. 1. The home as a place of rest. My home, first and foremost, should be a place of rest from labor (1 Kings 8:66, 12:24, 13:7; Psalms 126:6), refuge (Josh. 20:6; 2 Kings 14:12; 2 Sam. 18:17; Zech 10:10), and refreshment for my husband and children. This is most common purpose indicated through the Bible. It was intended to be a place of joy (2 Chron. 7:10; Psalms 126:6), a place to make happy with your spouse (Deut. 24:5). Can my family find rest in my home? Or is there constant tension or turmoil? Is there too much clutter that the body cannot rest? My home should be a place to welcome home my husband in celebration style. The women of old welcomed back their men in joyful celebration from the battlefield (1 Sam. 18:6). Our husbands face many battles at work throughout their day, conquering challenges, guarding against temptation, and have successfully brought home the bacon! Therefore; he deserves a joyful welcoming. Do I welcome my hubby home with a shout and joyful excitement? Does he eagerly look forward to coming home? 2. The home as a place to cultivate learning. It should have a continual atmosphere of learning and teaching of both knowledge and Biblical truth. “And you must commit yourselves wholeheartedly to these commands that I am giving you today. Repeat them again and again to your children. Talk about them when you are at home and when you are on the road, when you are going to bed and when you are getting up…Write them on the doorposts of your house and on your gates.” (Deut. 6:6-9) Is truth being taught and cultivated daily in my home? Am I seeking to train and teach my children in everything we do? What kind of lessons can I teach while we clean together, prepare meals, and cultivate the home? 3. The home as a holy place. It should be guarded from all things that might taint the holy dwelling. It is designed to be a place of protection for sinful temptation. A place where nothing abominable might dwell (Deut. 7:26). Are there any destructive influences coming into my home through books, technology, internet, or television? 4. The home as a place where thankfulness dwells. It should be a place where we testify of the Lord’s goodness to our family, friends, and neighbors (Mark 5:19; Luke 15:6). We see the New Testament believers sharing meals, breaking bread, and celebrating together (Acts 2:46). Great generosity, sincerity, and thankfulness abounded in the home. Does an atmosphere of thankfulness pervade my home? How can I be more purposeful in cultivating a spirit of joy and gratitude in my home? Is the conversation around our dinner table one that encourages and blesses others, that acknowledges God’s work in our lives? 5. The home as a place to welcome strangers, refugees, the homeless, and hungry. I was struck repeatedly by the numerous references to the home as a place to welcome strangers. The word ‘hospitality’ literally means: ‘welcoming strangers’. We see Lot looking around at the entrances of the city to welcome any stranger into his home (Gen. 24:23,31), and Abraham running up to strangers and welcoming them to his tent for a meal and refreshment (Gen. 19:2-3). If we feed the hungry and provide a home for the homeless, the promise is that ‘salvation will come!’ (Isaiah 58:7). So not only is the home to be a place of rest for family, but also for strangers, foreigners, and refugees. Feasts of generous proportion should be offered amongst an atmosphere of reflecting on God’s goodness (Prov. 23:6-8; Prov. 9:1-5; Gen 26:30; 1 Tim. 6:18). As soon as Levi becomes a follower of Jesus, we see him practicing hospitality by holding a mighty feast/banquet in his home and welcoming Jesus and all his friends (Luke 5:27-31). This was not natural for him. It took effort, preparation, and generosity. The Israelites were called to remember that they were once foreigners and aliens, and therefore to love others as they loved themselves (Lev. 19:34). Offering hospitality was a moral imperative. We all were once strangers and refugees who were graciously taken in by God (Deut. 10:19). There ought to be no loneliness in the home, but rather comfort and joy should overflow. How often do I eagerly run like Abraham to welcome others into my home? How often do I extend generous hospitality to someone new, lonely, or homeless? 6. A place to minister to the church, missionaries and evangelists. “When God’s people are in need, be ready to help them. Always be eager to practice hospitality” (Romans 12:13). Throughout the New Testament we see people opening their homes to missionaries to find rest and refreshment (Luke 10:38-42; Acts 16:15), as demonstrated by Martha & Mary, and Lydia. 7. The home as a place that reflects our eternal home. Lastly, our home should always be viewed as a temporary dwelling and an image or reflection of our eternal home (Hebrew 11:14; 2 Cor. 5:1, 8-9). It should not be a place we store much treasure in. The way we offer hospitality should image the glorious celebration that will take place at the end of the age. When people come into my home, they should sense the presence of the Lord. They should sense the joy and celebration that comes from living for Jesus. It should be a taste of heaven. Wow! The potential you have for the use of your home is incredible. Are you willing to join me in adopting this glorious purpose for cultivating the home? If our view of our homes is shortsighted, there is no motivation to accomplish the menial tasks of maintaining it. If we don’t cultivate a high and holy design for our homes, it is easy to slip into thoughts of frustration, comparison, or purposelessness. If we view our homes as a place of hospitality – to welcome our families and the hurting around us – there will be so much more strength and motivation to keep it clean, organized, and prepared. I’ve heard that Edith Schaeffer, wife of the late Francis Schaeffer, led more students to Christ through her cinnamon rolls than her husband did through all his philosophical discussions.What will be said of you? Has your vision for your home grown today? Republished from the archives for our Top 10 Celebration. Originally published April 14, 2010. 1 Peter 2:17 calls us to “Love the brotherhood.” I was recently praying for a practical way that I could serve other sisters in Christ in my church and community without taking me out of my home and away from my primary responsibility of nurturing and discipling my own children. I want to be intentional with every moment that the Lord gives me without over taxing myself by dragging my little ones here and there. One of my personal favorite birthday events is to have a mommy’s day off. This means I drop off my children at the grandparents and just have some alone time to plan and prayer over the upcoming year, do some fun shopping, or whatever my heart desires. I am so thankful to have relatives close by that enables me to do this. But I know many of my friends, sisters, and neighbors, do not have this blessing. So…why couldn’t I offer to watch their little ones so these Mommy’s could get out for a little while and even get a date in with their hubby’s? So this is exactly what I decided to do. When a friends birthday comes around (and thanks to Facebook syncing with my calendar, I always have these birthdays on my calendar), I will look for the opportunity to watch their little ones for a few hours so the Mommy’s can have some personal or date time (whichever they choose). I’ll invite the children to come over after our nap-time and stay through dinner time. I’ve done this on two separate occasions now, and it has been such a simple way to serve and a fun way to bless the recipients. It doesn’t require too much extra work because the children play together with my own. It’s also easy to let them watch a little movie if things get a little too wild or read books together or organize a little craft. I just want to make my home available to serve and love on the lives of others! Are there friends and neighbors in your community that could use a day off? Invite these children into your home and serve in this simple tangible way. This could be a powerful way to reach out to an unsaved family in your community as well. Of course it may take time to build trust in the relationship, but it is worth the effort to share the love of Christ. I treasure the holidays as a unique time of year to really reach out to others in simple practical ways and display the love of Christ to a watching world. Many are lonely or wrapped up in the busyness of the holidays. One of my passions is that we would seek to be intentional with every opportunity to be a light, especially working together with our children and cultivating hearts of generosity. This is our number one priority when planning our holiday schedule. These are all different ideas that our family has participated in over the years and helped keep our priorities on serving others rather than just gift buying for ourselves. It definitely takes a little thought and planning but the results are well worth it. 1. Make a special treat for your neighbors. Pumpkin bread, cookies, etc. I love making mini pumpkin bread loaves and sharing with the neighbors. I like to make them in early November, put them in the freezer for a couple weeks (which helps increase the flavor), and then deliver during Thanksgiving or before Christmas. Helps reduce the stress during the holiday rush. Whatever you are making for your family, make an extra batch and share with your neighbors or co-workers. 2. Make a little thank you gift for your mailman, trash collector, etc. Leave a plate of cookies and a Christmas card for these service providers. 3. Host a Christmas party and invite your neighbors. Whether it be to your neighbors or to an elderly care facility, this is a simple way of sharing the joy and true celebration of Christmas. Operation Christmas Child, Angel Tree, donating gifts (using their Christmas gift catalogs) through Compassion International, or Samaritans Purse, are all easy ways to join with your children in ministering to the needs in your community and around the world. I am helping to facilitate an Angel Tree project at my church to provide gifts to children of incarcerated parents in our community. It’s so simple and yet meaningful. You even get to deliver the gifts to the children within their homes and share about Jesus. Pretty special. 6. Adopt a family in need. One of my favorite Christmas memories was the year as a child we adopted a family in need in our church who was going through a serious health crisis, and we bought gifts for all the children and surprised them by delivering the goodies to their door. It has stood with me for memory years and inspired many more ventures to give some Christmas joys to needy families in our church. 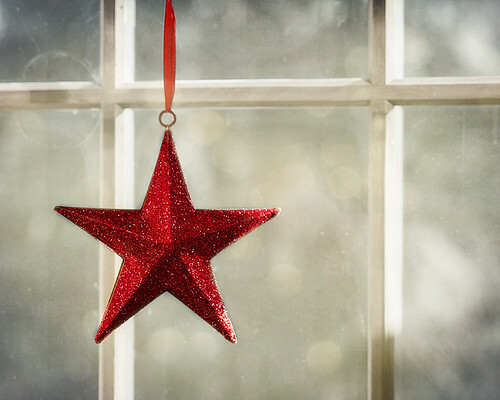 These are just a few ideas we have found helpful to keep the focus on serving others and giving our children opportunities to serve as well and cultivating a greater picture of the true meaning of Christmas. How do you enjoy being a light during the holidays? Operation Christmas Child is one of our favorite Christmas activities every year! It is such a fun and tangible way to minister to suffering children around the world alongside your children and family. It is a practical way to get the focus off ourselves and see the great neediness in the world around us. It is a simple way that we can extend God’s love to the nations. And our kiddos can participate each step of the way, from picking out gift items, to writing cards and letters to the child, to wrapping, to praying, and finally to seeing the destination of the boxes. You can track your gifts and see what country your shoe box went to, which provides fun interaction and educational experiences with your children as you can discuss the country, the needs, and geography. This is one way to give your children a heart for the world. Watch the promo videos together and all your hearts will be touched. I cannot encourage your family more to participate in this awesome project! Last year, I shared how I heard back from a child I had sent a shoe box to nearly ten years before. I got to see firsthand the impact of that gift. Read more of Meryl’s story here. 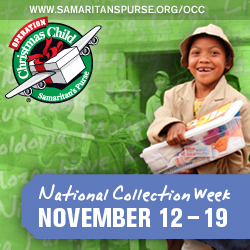 Collection week is November 12-19, 2012. Find out more information, drop spots, how to track your gift, and more here. Need some ideas of what to package in your shoe box? And the kids loved drawing a picture and writing a special message to each of the children which adds a personal touch from our heart to theirs. Will you join us in bringing the love of Christ to children around the world? It is important to create special moments with our daughters. I like to have tea times where we prepare yummy treats, dress up and have a few friends over. This past tea was no exception. Princesses and fine ladies sat around a beautifully set table, nibbled on delicious treats and sipped fragrant tea. Teas are also an important time to teach manners in a fun environment. While I try to teach my daughters to have good manners and be polite all the time, teas are a fun time to put those manners into practice. Saying please and thank you, not slurping, having our elbows off the table, even putting our pinkie fingers up in the air while we drink our tea. Additionally teas are a perfect time to invite girls and their mothers from the neighborhood. It can be a wonderful way to reach out to our unsaved neighbors in a friendly non-confrontational manner. Simply invite some mamas and their daughters and enjoy one another’s company for a time of fun and fellowship. I want to serve special treats for my girls to enjoy but at the same time I don’t want to sacrifice nutrition. I have found that it is easy to make treats that are nourishing without sacrificing flavor. This past time they nibbled on chocolate cherry coconut flour cupcakes, soaked lemony scones, lemon curd and sourdough blueberry muffins. We drank Rosy Black Tea sweetened with raw honey and a touch of farm fresh raw milk. None of our guests noticed the difference yet it was important to me to not sacrifice our nutrition by compromising and using refined sugar and flour. With exception to the coconut flour, none of the treats cost anymore to make than it would have to use refined products. I grind my own wheat, buy coconut oil in bulk, use lemons from my own trees and purchase my milk and eggs from a farm down the road. Here is our favorite special tea to serve at Tea Time. The roses impart a delicious, light flavor. Bring the water to a boil. For convince sake place the Rosy Black Tea in a large mesh tea ball or a small linen bag. Place the tea in your teapot and pour in the hot water. Let steep for five minutes, remove the tea leaves and then you are ready to serve. Add a little honey and milk/cream for a delicious tea. 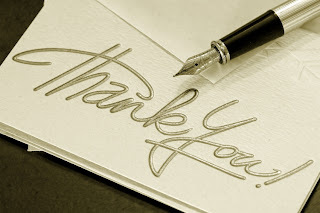 How often do I take a moment to write a thank you note to one who has blessed me recently? This practice is such a edifying habit to get into. 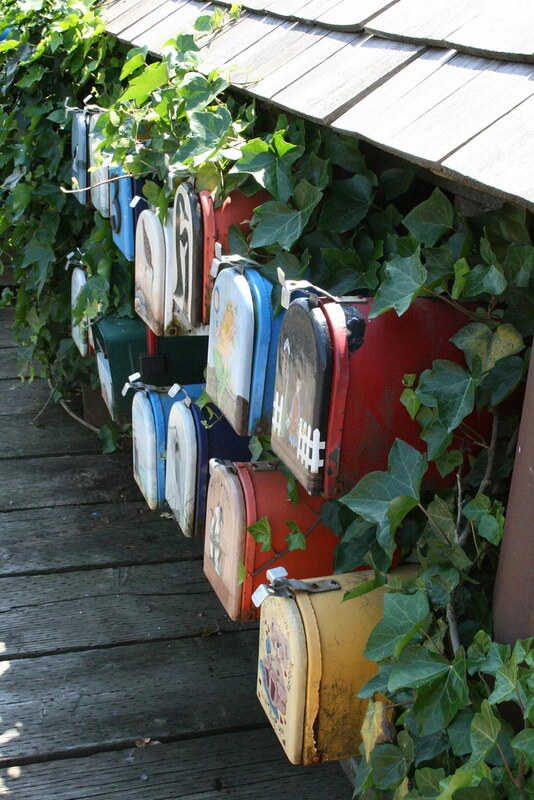 Why should we write thank-you notes? It is to acknowledge our appreciation for the love of others! It tells others we are blessed by their fellowship, the way they served us or others, their giftings, etc. It encourages them to continue in the calling that God has placed on their lives. It is so easy to become discouraged and overwhelmed, this is true especially for those who are in places of authority in your life (church, parents, leadership). They need a little note now and then just letting them know you are praying for them or that you are blessed by their service. Who has ministered to you lately? Take a moment to jot down a thank you note. Have a box of thank-you’s always on hand for these occasions. You can find great deals on boxes of notecards at the Dollar Store. If a sermon ministered to you, write a note of appreciation. If someone extended hospitality to you, don’t forget to let them know that you enjoyed their fellowship and the invitation. If someone served you in someway, acknowledge it! Make it personal and specific. It doesn’t have to be long and detailed. Short and sweet will do the trick! Just write it from your heart. Ask the Lord for the words to write that would bless them. Write thank you’s with your kids from a young age. Even if they are too young to write words, have them draw a special picture and have them dictate words for you to write. Cultivating a heart of thankfulness is so important. For a long time I have sought to cultivate the habit of writing one note of encouragement each week to someone in need of prayer, support, or simple encouragement. I think and pray about someone I know who might be going through a hard time, sickness, etc. and ask the Lord for the words to speak and/or Scripture passage to include in a short note. I have been so blessed over and over by the response I received from these simple notes. One time a suffering sister called me after receiving my note and said it came at just the right time when she needed it the most. How was I to know her trial if it weren’t for the Lord’s prompting! There is just something about getting a personal and thoughtful note in the mail from someone that was thinking of you that ministers powerfully. Pray that the Lord would give you the words to write that would minister to them right there and now. God can use this ministry in amazing ways. Offer up a little prayer as you send it on its way that it would be able to bless its recipient. I have recently been compiling a list of the birthdays of all my friends and family as a gentle reminder for me to send them a little note of blessing on their special day. Sometimes I forget, or the birthday wishes come in the form of an email, and that’s perfectly okay. There is grace for every season. Take the opportunity to wish them a happy birthday and include a note of encouragement, if appropriate, and list out a few ways that you see God working in their life. This is one simple way that you can minister and impact the lives of others without even leaving your home. Encouraging words have power to strengthen the weary soul. In an age of technology, let’s not forget the power of a handwritten note. It doesn’t have to be forgotten. Originally published November 16, 2007. Some of my most memorable summer experiences as a teenager involved going on both domestic and international mission trips. Whereas many of my peers looked forward to tanning on the beach or taking a trip to Disney World during our summer breaks, I spent the school year raising money for my next mission trip adventure–whether it be to the inner city of Philadelphia, Pennsylvania, the rugged coastlines of Scotland, or the poverty-stricken villages of Peru. I couldn’t deny God’s calling to go and serve–and proclaim His gospel to the nations. I met my husband while serving a year-long term in Costa Rica after college. After we married, we spent summer “vacations” in China and Africa. And after our first daughter was born, we spent a semester ministering to refugees in Vancouver, British Columbia, Canada. When we returned to the States and continued to grow our family, I struggled with how we’d apply our call to missions while living full-time in the United States. I soon learned that families can minister both internationally and locally from home! Here are 7 ideas for an at-home summer mission “trip”: 1. Sew pillowcase dresses together for Dress a Girl Around the World. This ministry collects handmade pillowcase dresses and distributes them to impoverished girls. Even the most novice of seamstresses can sew a pillowcase dress, and your daughters will enjoy learning how to sew for others. Pray over each dress before sending them off, asking the Lord to use the physical need you are meeting as an open door to share the gospel. 2. Host an orphan in your home. New Horizons for Children is a Christian-based, non-profit organization which brings school-aged, orphaned children from Eastern Europe to the United States to share the love of God and a family. You can host a child in your home for 6 weeks for a fraction of the cost of what it would take for your entire family to travel to another country for a week-long mission trip. Several families in my church have participated in this program–and many of the have children come to know Christ during their stay! 3. Collect baby formula for orphans. But isn’t breast best? Well, yes, I’m a huge breastfeeding advocate and even nurse my own babies until they self-wean, but the raw facts are that millions of orphaned babies around the world have no mother to nurse them. There is often a shortage of donated milk for these babies, and without formula, they will die. Brighton Their World is an organization that collects and delivers both infant formula and handmade blankets to these needy orphans around the world. 4. Minister to nursing home residents together. Whether your children are young and can do nothing more than make cards, or if they are old enough to play games with the elderly, a visit to your local nursing home can prove a blessing to the sick and often-forgotten of your community. 5. Minister to a widow–while raising money for an adoption. James 1:27 says that “pure and faultless religion” is to look after widows and orphans. I love how Both Hands is a ministry that combines these. Instead of raising funds via running a 5K, etc., this ministry asks participants to solicit sponsors who will donate money, so they can help a widow with home repairs, painting, etc. The money then goes to a couple who is adopting an orphan. Older children can participate alongside their parents in the home repairs. 6. Send a care package and/or set up a Skype chat with international missionaries. Although it was only for a short time, my husband and I know the loneliness that international missionaries can experience while away from friends and family. Receiving a care package can be a huge encouragement and help renew weary missionaries. The gifts need not be big; most missionaries would be delighted to receive even the smallest of treats from their home countries. Is postage too much? Why not set up a virtual chat via Skype, where you can invite these missionaries “into your home. 7. Host a neighborhood Vacation Bible School. Some unbelieving families wouldn’t dare drop their children off at a church VBS, but they may be more open to leaving them at a neighbor’s home to play games, sing songs, make crafts…and learn about Jesus. Is your house too small? You can always host a one-day event at a neighborhood park. Check out some wonderful VBS materials through Children’s Desiring God. What are your ideas for a stay-at-home summer mission trip? Erin is a believer in Jesus Christ and stay-at-home wife and mom of two little redheaded girls (with a third on the way!). She is passionate about Jesus, mission work, her family and researching how to live a healthier lifestyle. She writes for several print and online publications, blogs about natural living and homemaking at The Humbled Homemaker and also edits eBooks. The idea of “stuff” has received a bad rap over the last few years with the growing simplicity movement. There has been a strong pull towards getting rid of everything so you have more freedom, fulfillment, and time for more important things. Cut back on lifestyle, live smaller, enjoy less. Many of these principles have inspired our lifestyle choices as well. But should I get rid of everything? Does it require me to sell everything and live in a tiny apartment in order to really pursue this lifestyle of simplicity? I believe it’s time to get a God-centered view of stuff. We need a bit more balance. Why has God given us this stuff? God is the giver of all good things. James 1:17, “Every good and perfect gift is from above, coming down from the Father of the heavenly lights, who does not change like shifting shadows.” He has provided us with resources, a home, and the stuff within to be used for the purpose of serving others. God gives us all things to enjoy but desires us to use them for the furtherance of His glory and kingdom. Ephesians 4:28 reminds us: “He who has been stealing must steal no longer, but must work, doing something useful with his own hands, that he may have something to share with those in need.” It’s a call to work hard. Why? So we have something to share. It’s not just for us…it’s given to provide for our basic needs and to be shared with others in need. Alls we truly need is food, clothing, and shelter. And every other thing should be purchased with intentionality. We could simply give it away once, but there is a way I believe we can use many of the items in our homes to bless others over and over again. Certainly simplifying will include getting rid of some things, but other things should be dedicated to a sharing category. I love reading about the early church’s passion for sharing. “They were of one heart and soul, and no one said that any of the things that belonged to him was his own, but they had everything in common…there was not a needy person among them…” (Acts 4:32, 34). This model of sharing and caring for one another was a powerful witness to a watching world around them of the love of Christ in action. This can certainly include selling things and sharing the profits with those in the community of believers that have needs…but it can also include simply making our resources available to one another through loaning, borrowing, exchanging. Passing around your children’s clothing. Sharing your baby items in between your use. A bassinet is only in use for 6 months or so…why not loan it to another new family? It clears out space in your home until you need it again. Holding a book library to share the rich treasures of books you have with others. Make a master list of all your books and pass it around to others for their reference. Sharing your homeschool curriculum. Some of these materials are super expensive. Why not loan it to another family while you aren’t using it. Loaning out your extra car or bedroom to missionaries or needy members of your church. Host a clothing exchange, community garage sale, homemade food goods exchange, and exchange items for free. Making a double batch of your dinner and sharing with a family that has just had a baby or experiencing a different trial. Share a skill you have by teaching it to others. Hold a work party to help someone move or get a job done around their house. Open up the doors of your home in hospitality. Your home, however big or small, is a gift to be used to bless the lives of others through your hospitality. I like to call it missional homemaking...everything you own is held loosely because it’s on a mission. A mission to comfort, nourish and support those that God sends your way. It needs to be held loosely because it may get damaged or broken along the way. Your carpet may be stained, your toys may be broken. But if you have a God centered view of stuff you will be able to rejoice because it was used for the furtherance of His Kingdom. Having a descent size home is very beneficial for the extension of hospitality. We intentionally bought the biggest house we could reasonably afford. We picked a house that had small bedrooms and a large living space. Because we wanted to make it available for the use of others. We wanted to be able to welcome crowds of people to find refreshment through our doors. Every time you open your door you are sharing the love of Christ to a watching world. Our basement is set up for hosting worship practice, our living room is open enough to sit larger groups for community group, leadership meetings, dinner parties, church events and so much more. We had several parties last year where over 100 people passed through our doors in a 3 hr period. Praise God! Hospitality is so much fun! Even in our small first home of a condo, we didn’t make the small space an excuse. We filled up that small space with only that which was useful for hospitality and filled it over capacity with people. It was often tight with people but sweetly intimate for the joy and laughter shared with others. God centered simplifying is letting go of anything that is ruling in my heart. What am I afraid might be damaged? That might be a clue to an idol in my heart. Pray that God would change your heart and give you the grace to offer up your stuff for his use and purposes. If it is not beneficial for the use of others, then it can be discarded. Dedicate your earthly goods to his Kingdom use and see Him work. A God centered simplifying lifestyle is letting go of the stuff that’s just cluttering my life (that hasn’t practically served our family or others in the last 6 months) but preserving the stuff that is useful in the ministry to others. We buy descent furniture but not expensive stuff that I would be afraid to have damaged, scratched, or broken. Yes, it has certainly seen some wear and tear. We buy consignment clothes so I’m not afraid if someone returns our borrowed collection and a few items are stained. We buy used reliable cars that can be loaned out as a brother has need. We sift out the stuff that is not useful. Is it serving to strengthen our family or be used in service to others? If not, get rid of it! Make sure everything you buy has a purpose outside yourself! Invest in a few items that will help extend your hospitality: A large crockpot to serve large gatherings? Serving forks, trays, large water pitchers, outside bikes for kids to play with, etc. When we were newly married without kids, we still wanted to reach out to families in our church. An older family in the church gave us a random assortment of small toys that they had cleared out of their inventory. This box was a huge help in assisting to make our hospitality so much more enjoyable for the little ones. This is a beautiful mix of simplifying but sharing going on. I have learned in this pursuit of simplifying and sharing…the more I share and let go of, the more my heart desires to give. The more we give and share, the greater our treasure is being stored up in heaven, and the less of a stronghold this stuff has in our hearts. When I see everything I own as simply a tool through which I can bless another, it no longer worries me to see it damaged or ruined. And God is glorified as He takes the place of our all-consuming love, rather than it being in anything temporary in this world. Giving and sharing is the greatest investment of your resources! How can you intentionally share the “stuff” you have right now? How can you seek to build a sharing community? Do you know the woman next door? Or the one across the street? Chances are, she’s not much like you. Statistics predict she’s not a stay-at-home mom, and doesn’t have more than 2 children–if she is a mother at all. She may not cook like you, dress like you, or read the same books. And she might not even go to church. So, why would you want to have anything to do with her? Because we’re called to love our neighbor and we were created for community. You live on the same street. And that, sisters, is a connection that is often missed in the face of all that makes us different. Yet that one commonality—physical proximity—is another huge factor in building a relationship, and has been the foundation of many life-long friendships. It was when we left our first home and the trailer park we’d lived in for 3 years that I became convicted that I had not been a good steward of the relationships that had—literally—been right in my backyard. Part of my delinquency was due to the natural inward focus of that first season of marriage, but I also knew I had let differences in lifestyles keep me from reaching out and building relationship with my neighbors. At our new home, I resolved to be more faithful to God’s commission by His grace. To step out of my comfort zone, to put forth a little effort, and see what would happen when I chose to love my neighbor. We started by hosting an open house that first fall. I made a huge pot of chili, several trays of cornbread, and we had a bonfire and music and invited everybody we knew—including the family that had just moved in across the street from us. In this group setting we enjoyed our first casual conversations with our new neighbors, and watching them walk back over the street to go home, I thought what fun it could be to have a friend who lived that close. So, I reached out again. First just a hello across the road when we fetched the mail or were both doing yard work. Then a play date with our kids. Then dessert as families when the strawberries were ripe. For the first time in my life, I was experiencing what it was like to have a neighbor. And I liked it. There’s something about being able to run down the driveway to borrow an egg, or sympathize over the heat wave or have someone near when the weather’s too bad to go anywhere. Opportunities to fellowship are right out the front door, instead of an hour’s drive. And while reaching out and being willing to deepen the relationship, I discovered that, though she and I were raised differently and our lifestyles were not exactly the same, we did have other things in common–she was a believer! And we both desired to be a better wife, more loving mom, and to grow in our faith. So, we started a Bible study together. Three or four times a month, while my kids were sleeping and hers were in school, we opened our Bibles, read a few verses and prayed and asked the Lord to speak to us. Despite our differences, the Lord had brought us together, bonded us, and revealed to me the joy He planned when He told us to ‘love our neighbor’. Lately I’ve been inspired to explore new levels of community that await at the end of my own driveway, and to encourage you to see what relationships God may have called you to in your own neighborhood. God designed us for community, but it won’t happen unless we invest ourselves. And perhaps, while celebrating what we do have in common—the same street, weather, and postman—we’ll have opportunity to share our love, our hope, and the God that can change lives. How have you been able to reach out to your neighbors? What has worked for you? What challenges or successes have you experienced? How do you foster community in a more rural setting? In the City? I’m still new at this and would love to hear what you’ve done! Please share in the comments! Do you sometimes feel inadequate in prayer? Do you often struggle with praying together with your spouse or children? 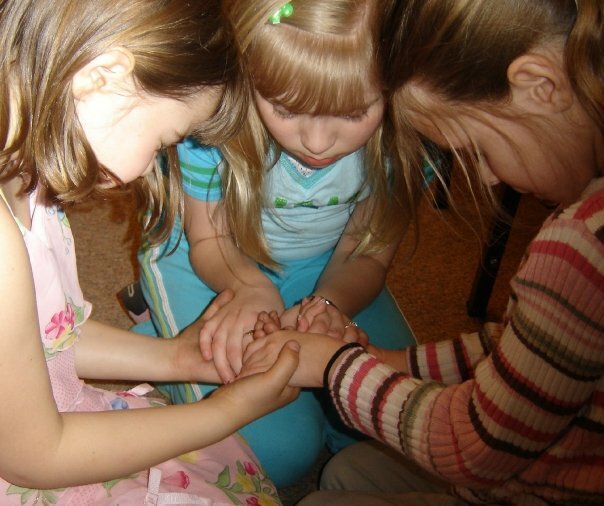 Do you perhaps wonder, since it’s so difficult, if praying together is even worth it? You can rely totally on the Cross of Jesus Christ! If you are a Christian, you have likely heard how important is is to pray together as a husband and wife, or together as family unit . . . but have you often wondered why this is often so difficult and humbling? Or maybe you’ve honestly wondered if your prayers, and the simple prayers of your far-from-perfect family, can really make a difference? It’s actually that very gut-level of honesty within a family, and our knowledge of each others’ inadequacies, that makes praying together so powerful. You can’t be fake when praying with your family; you have to rely on God’s forgiveness and His righteousness through the Cross of Jesus Christ. If we could comprehend, deep in our spirits, the true power of prayer, we would all pray more–and the difference would radically impact our lives and the lives of those around us. We want our prayers to be effective, but what does it mean to stand “righteous” before God? It’s totally standing and relying on Jesus Christ and HIS righteousness, not coming to God based on our own “good works” or efforts! We need to realize how powerful and mighty He is. Our Self-efforts are like Filthy Rags . . . The next time you come across an extremely dirty rag in your house, use it an opportunity to share an important lesson with your kids. We may think our own self-efforts help us earn “Brownie points” with God. But, to Him, our human works are as worthless as stinky rags. If we try to earn favor with God–instead of trusting in Jesus–it’s like collecting yucky rags. The more they pile up, the more they stink and mildew. As you walk around your neighborhood, take time to quietly praying for each neighbor, and seek God for ideas on how your family can be a light for Jesus. Have your children make a “Ten Most Wanted” list or poster. Have them think of ten people who need Jesus. These can be relatives, neighbors, famous people, or the man who works at the convenience store. Use this list or poster to remind you to pray for these people to come to know the Lord. Put a small world map on your refrigerator, and use this area to display newsletters from missionaries you support, along with current international news updates. Pray regularly as a family, perhaps around the dinner table, for specific world needs and for people you know who need the Lord. The power of family prayer is relying on Christ’s righteousness! In prayer, each of us must come to God in an attitude of total surrender and humility, keeping our hearts clean and open before Him. Through the cleansing sacrifice of Jesus Christ on the cross, every mom and dad, and boy and girl, can pray as a “righteous man” before God. Because of Christ’s forgiveness and righteousness, even your family can come before God with boldness and authority to effectively intercede on behalf of others. So, what do YOU think about family prayer? Is praying together as a family (as a husband and wife, or with your kids) a spiritual priority in your family? Has praying together been a delight . . . or a struggle and a challenge . . . and can you share any specific reasons why? Have you had any specific moments of encouragement (or a key or idea that has helped YOUR FAMILY to pray together with more effectiveness)? Or do you have a story, or a “testimony,” of a time when a specific family prayer was answered? I would LOVE to hear your thoughts . . .